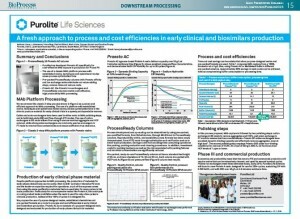 This poster will introduce Praesto™ AC protein A resin and ProcessReady pre-packed columns from Purolite. Platform processes for MAbs manufacturing have long been used to save time and costs. The use of highly productive, cost- effective resins in such platforms can magnify these savings, and the addition of ready-to use formats can further enhance process efficiencies. Our approach is to maximize these efficiencies and cost savings in early clinical-phase production and in the manufacture of biosimilars by using stage-appropriate materials and tools, eliminating of non-value adding work, and employing established methods that reduce optimization work. Praesto AC agarose has been specifically designed and evaluated for MAb capture steps in PI and PII production, exhibiting capacity over 30 mg/mL at 3 minutes residence time, excellent pressure/flow performance, and NaOH CIP stability for up to 20 cycles. Purolite’s agarose-based Praesto ion-exchangers use well-established ligands, and combine high resolution at high MAb loads with excellent pressure flow properties. All Praesto resins are now available in pre-packed, pre-tested and fully documented ProcessReady columns. We will present the process and cost efficiencies possible with a three-step Mab platform process, sized for early stage production runs and employing ready-to-use formats.